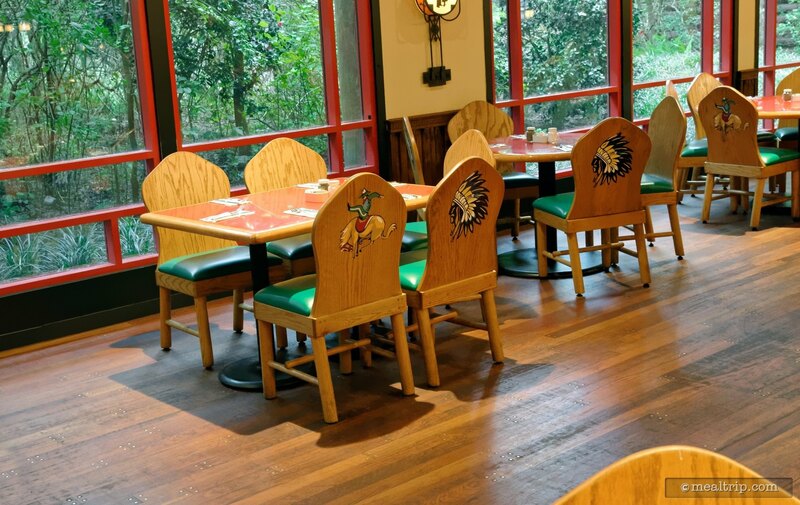 The Whispering Canyon Cafe is the Wilderness Lodge's main table service restaurant (the nearby Artist Point is a "signature" dining location), and serves meals from sun up, to way past sundown (but breakfast is usually served from 7:30am until 11:00am... times may change seasonally). 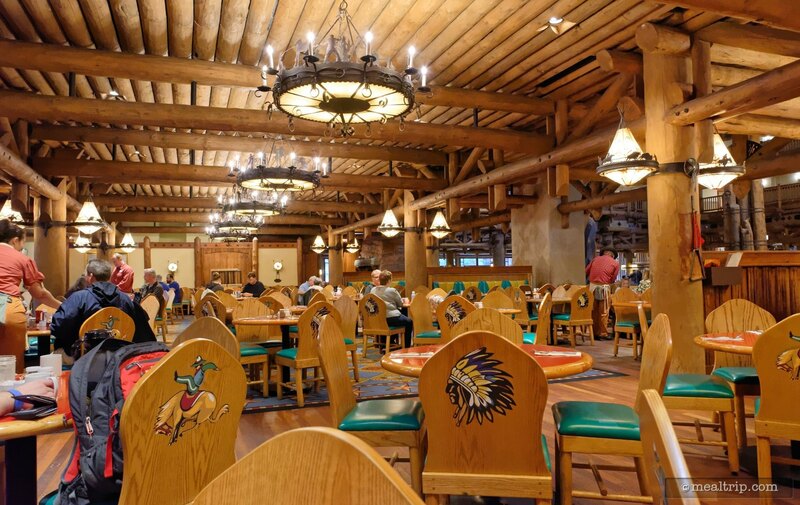 The decor is very much "Kitschy American West" but somehow, the large dining area doesn't feel like a mock-up. The genuine National Park feel that's in the resort's lobby is still visible from most of the restaurant's seats, and spills over quite a bit of authenticity. 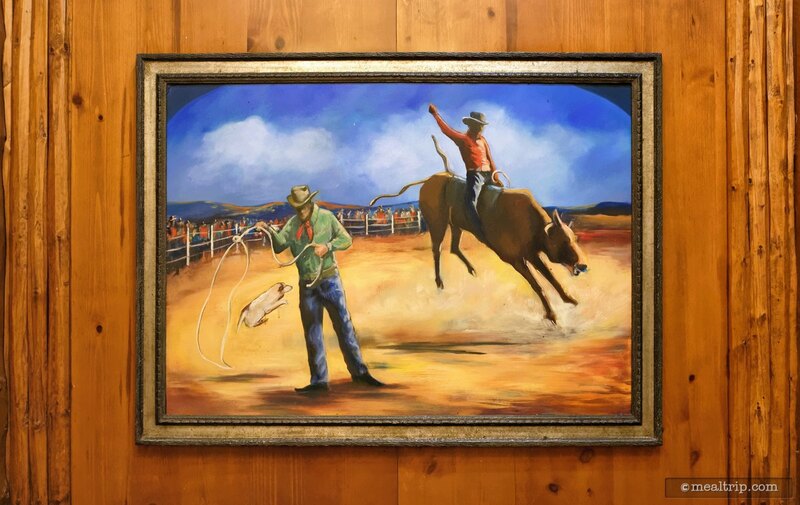 For breakfast, the Old West eatery serves up a waitstaff with a lot of sass (it’s all part of the show), and some good old American West grub. Just don’t expect a "quiet" breakfast here. 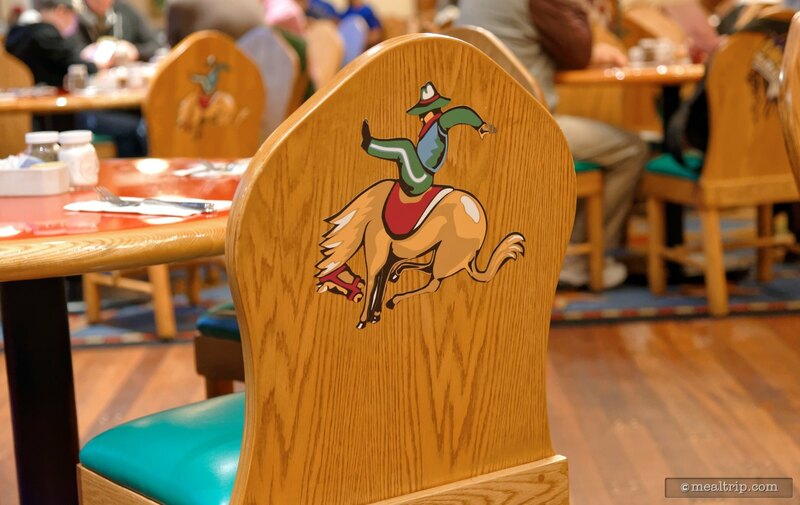 Shenanigans are aplenty at the Whispering Canyon Cafe. 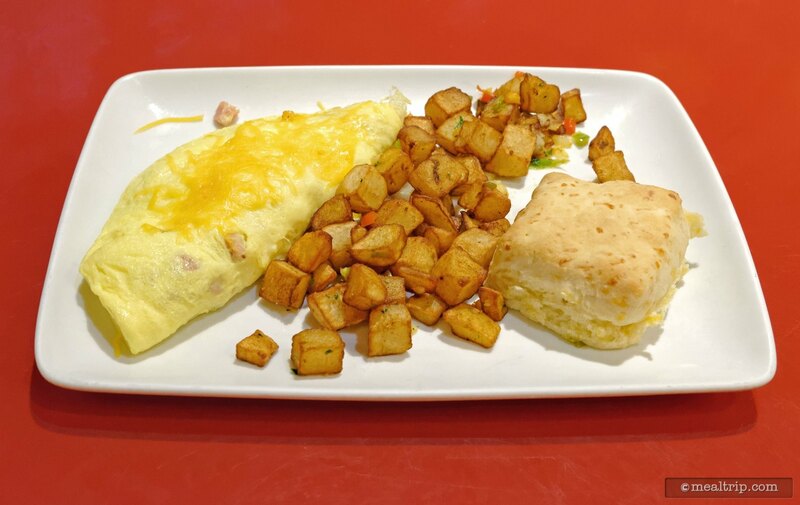 Many associate the location with the popular All You Care To Eat Skillet, which for breakfast, includes some pretty standard items... 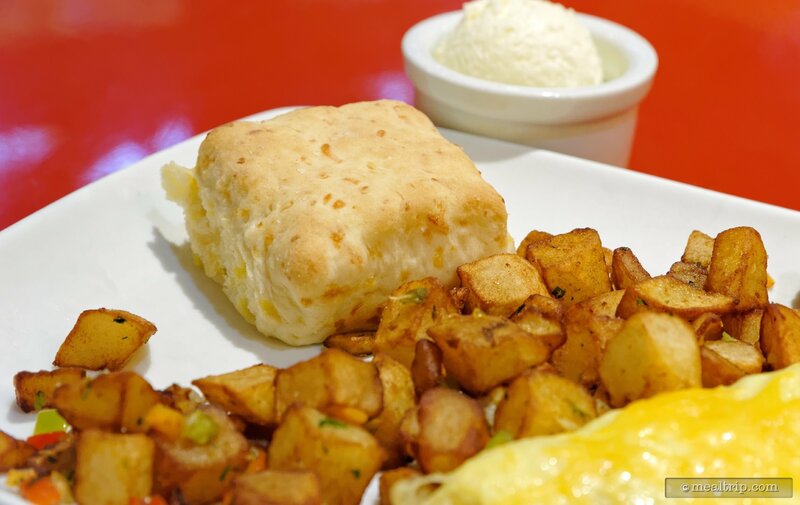 Scrambled Eggs, Western Home Fries, Bacon, Sausage, Waffles, Buttermilk Biscuits, and Sausage Gravy, for example. 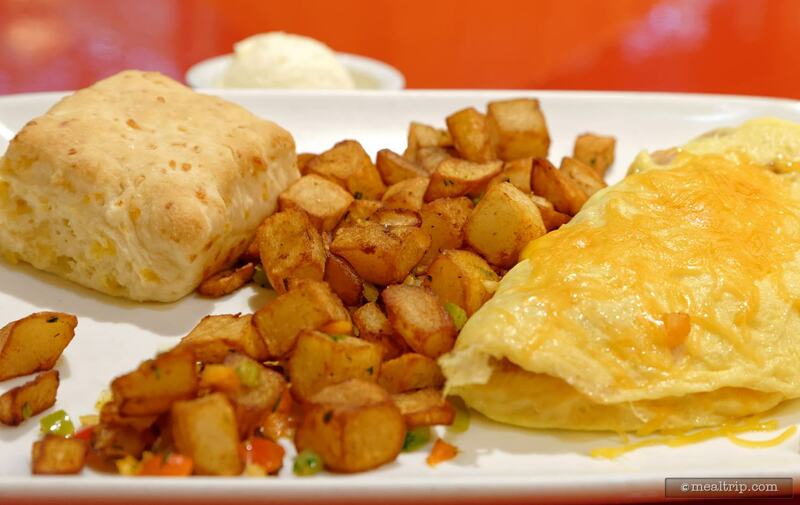 The breakfast menu does include some a la carte items though, that are a bit more complex (than just a skillet full of standard breakfast items that is), including Belgian-style Waffles, Eggs Benedict, and House-made Banana Bread French Toast. 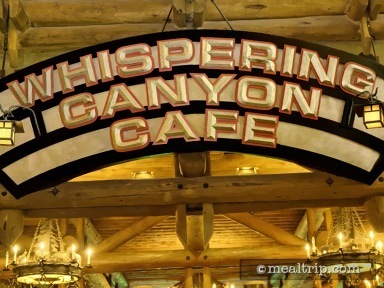 I'm sure the name "Whispering Canyon Café" was meant to be a little ironic. 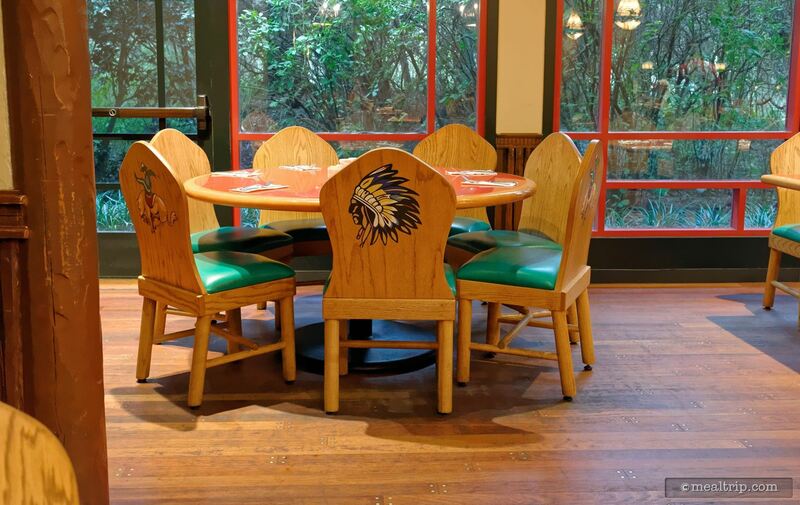 At peak dining times, the popular Wilderness Lodge restaurant is anything but quiet. Fueled by the antics of servers and cast members, guests are encouraged to have a family-friendly rowdy time. To be clear on where I stand on fun, loud, "show" dining … it's not really my thing. Which is probably why I enjoyed my recent 7:30am breakfast at Whispering Canyon Café so much. The restaurant name takes on a much more literal meaning at the crack of dawn. There were maybe 8 tables occupied by guests — and they were pretty quiet tables at that. These little pocket moments are some of my last remaining "gems" when it comes to Disney dining… the food is usually okay, and I really like the idea of "themed dining"… so it's an extra treat for me when the place is quiet and low-key enough where I can hear the background music, stop and look at some of the detail in the decor and costumes that the cast members are wearing, and just realize how few people get a chance to really soak in the actual environment of the place. The Whispering Canyon Café turned into a place where you could actually hear people whispering from across the room. Imagine that! Food-wise, I didn't get the "all you care to eat cast iron skillet" thing. Gasp, I know, right? It's a good option… I've had that for breakfast before here and it's a lot of food and a lot of fun. If people keep offering me food though, I tend to keep eating way past when I should have stopped... and I had a lot of walking around to do that day. 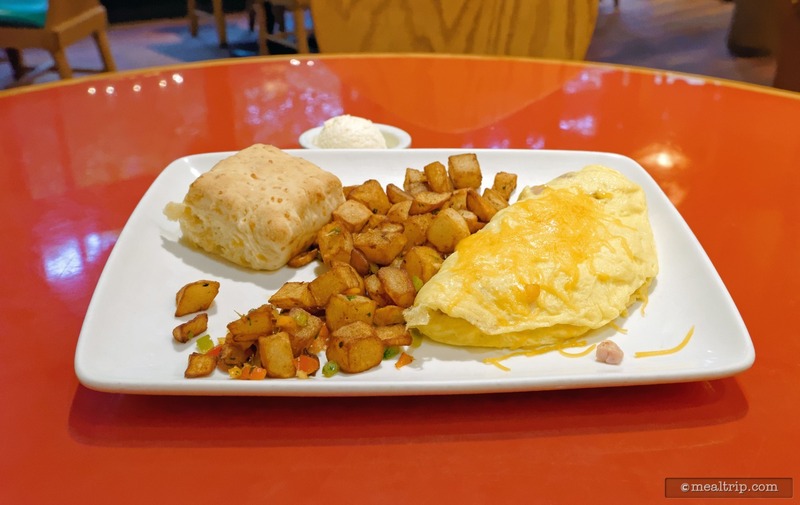 As a lighter option (but not too light), I selected the Ham and Cheddar Omelette which is served with Country Potatoes and a House-made Buttermilk Cheddar Biscuit. Not keep anyone in suspense… I thought it was quite good! Foodie purists might wonder if they use fresh, cage-free eggs, but contrary to my very early morning dining experience, this location does get quite busy, and there's no way they could keep up with the volume or the expense. I'm sure these are commercial kitchen quality liquid eggs, but the omelettes are made to order, had no burnt edges or ooziness, it was nice and fluffy, and the portion was a decent size (aka any larger, and I'd be too full). 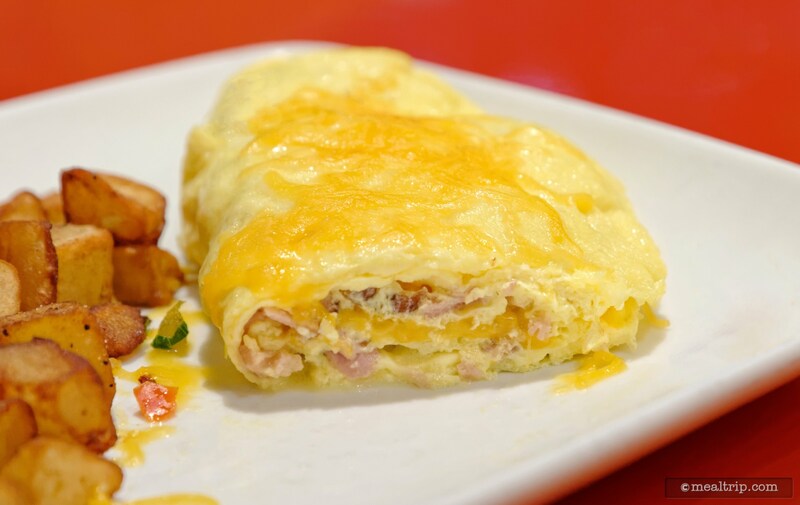 The ham and some cheese is folded over on the inside of the omelette with a little additional cheddar melted on top. 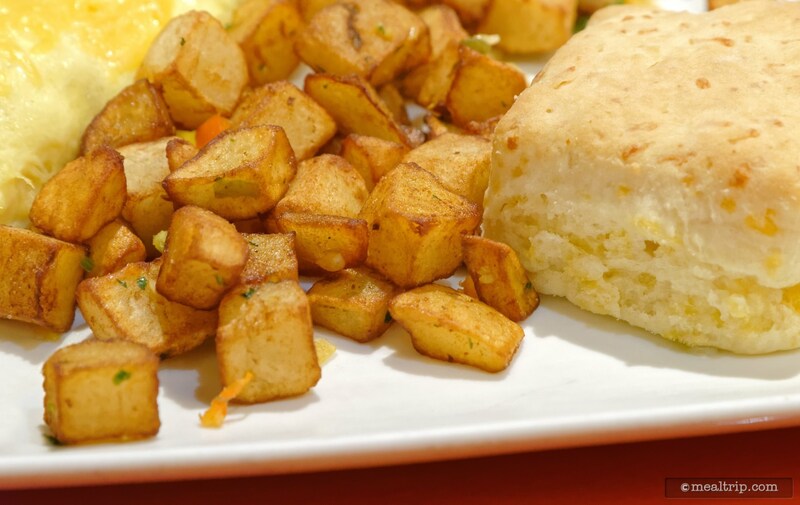 You could cut any part of this breakfast entree with a fork. 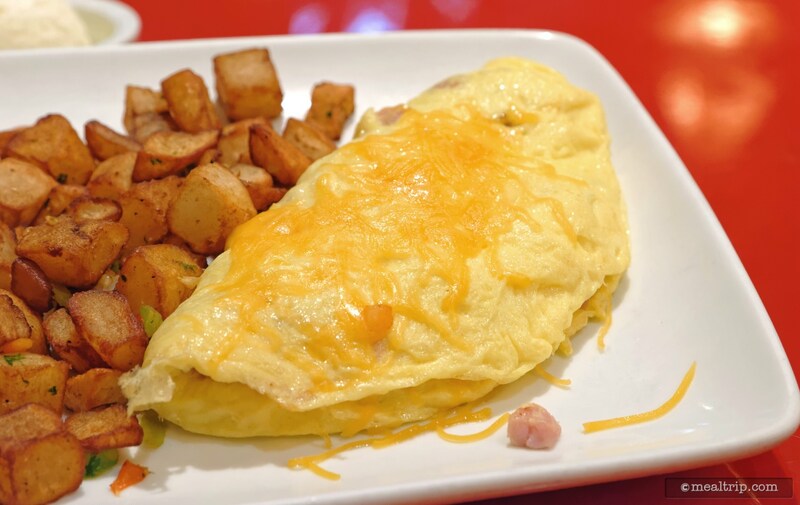 I could taste all of the individual components here… and while it's not going to win any awards for groundbreaking culinary discovery… it checked all the boxes for being a great omelette. 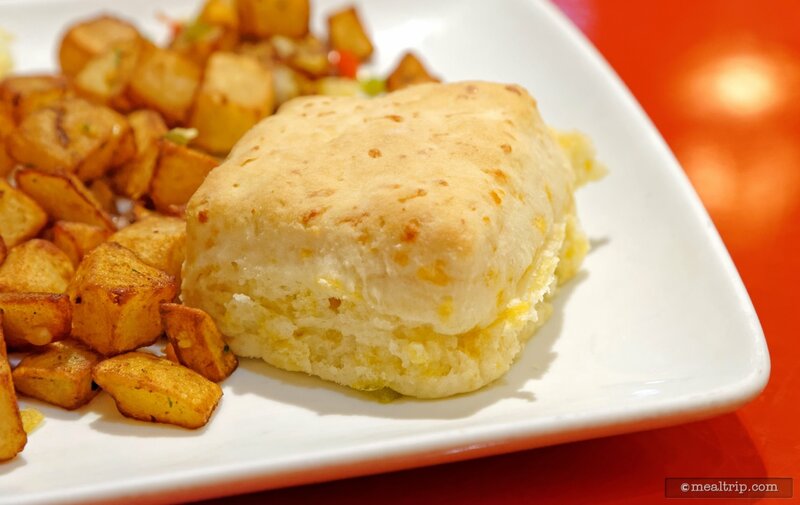 The House-made Buttermilk Cheddar Biscuit was much lighter than I was expecting it to be, and that's not a bad thing at all. I find that most high-volume Buttermilk Biscuits are made way too dense and heavy, but this one was super light. While I could see the cheddar baked into the top of the biscuit and I'm sure buttermilk was used somewhere in the process… you really couldn't "taste" either of those components. It was still a fresh biscuit though and I'm giving it a thumbs up for being so fluffy and light. I want to say something like "I'm glad the butter was on the table", but there are very few Disney locations that serve real "butter" anymore. The butter that was on the table, was more like air-whipped margarine that doesn't really melt or do any of the things you might hope butter would do. The best part of the plate was those Country Potatoes. While the potatoes themselves were admirable, not overdone, not underdone, just fresh and hot… what made them really special were these small flakes of pepper, onion, and some kind of small green dried herb. There wasn't much of it in there and you really have to get close to see it, but tossing those few extra veggies in there when sautéing the potatoes adds so much flavor… and a ton of aromatics. The thing that you could smell wafting up from this plate were those Country Potatoes… it smelled like breakfast… and tasted even better. If you're looking for a nice, quite moment to really enjoy some of the details and theming that goes into a restaurant like this, I'd highly recommend booking breakfast… as soon as the place opens. For Whispering Canyon Café, this means 7:30am. I've been checking for days in a row now, and there's almost always a 7:30am table available, so you can be a little more spontaneous, if you get up early enough. The food was great, and it was so nice being able to hear the fun themed background music and actually "talk" to the waitstaff without feeling like part of the show. A nice, real, breakfast that was a quite, calmly paced change from other peak busy-time dining experiences at Disney Resort locations.